In the competitive construction industry you need to be using the very best machinery for the job - equipment that not only can be relied on to get the job done, but also has outstanding performance. Recent changes to the Health and Safety Act have shone the light even brighter on the need for you to run a tight ship - having the right machinery can help make that happen. Here we explain how Webbline supplies New Zealand construction companies with the best construction machinery in the industry and how your business will benefit from using our premium equipment on your next project. When you hear ‘European design and manufacture’ you automatically think premium quality, faultless design features and state of the art technology. This is exactly what you can expect from the first-class European construction related machinery that Webbline brings to New Zealand customers, with our added value of importing directly from the manufacturer. The design and manufacture of construction equipment in Europe has a long history and with this comes the advantage of experience. This experience brings the knowledge that's needed to produce cutting-edge machinery. European machinery and equipment has a proven track record, complying with all international safety regulations including New Zealand’s recently updated Health and Safety Act. The European market is developed, strong and innovative, and the major brands have a sole focus on developing telehandlers. The quality of the original products and raw materials is second to none, as the steel produced from European mills and the electronics in their construction equipment are proven to be the best. Our suppliers will only select the best! There are no shortcuts here – only high quality, well tested (whole build process) equipment makes it to market. European manufacturers are focusing on operator comfort and safety in new equipment, while increasing the productivity of the machine. European made equipment must adhere to global standards including ISO standards and industry standards. Many of our European based suppliers are solely focused on producing one type of equipment type, allowing them to focus and perfect their product. Fast answers: Our response to any product enquiries is fast, accurate and meaningful. Access to inventory: Complimenting this requires Webbline, as the direct importer, to carry a comprehensive spare parts inventory. Full support: Along with this, our technicians are fully factory trained to support the products we represent. With our European machinery products offered by our Waikato, Canterbury and Southland branches, our sales team can confidently assess your situation and, drawing on many years of experience, give you the best advice. At Webbline we are here to advise and support you on selecting the right machinery to benefit your construction projects. We take pride in spending the time to understand what your project goals are and what you need to do to achieve them. We look at the details of what you’re doing to see what will work best - do you need fixed, rotating, or heavy-duty equipment? How much lift capacity do you need? How much reach? Which attachments are you after? We have a dedicated approach and an experienced team. This isn’t to be undervalued - the majority of other companies offer salespeople without the skill set to recommend what to use, instead taking a more reactive approach. Our purchase, hire and lease options can be as tailored as the machines themselves, so no matter what stage you’re at in your business, you can reap the rewards of running top quality machinery. As anyone in the NZ construction industry knows, health and safety is a top priority. From building sites, earth moving contractors to drainage and civil works, it’s everyone’s responsibility to comply with regulations. The Health and Safety at Work Act 2015 (HSWA) came into effect in April 2016 and sets out principles, duties and rights in relation to workplace health and safety. A guiding principle of HSWA is that workers need to be given the highest level of protection from workplace health and safety risks, as is reasonable. 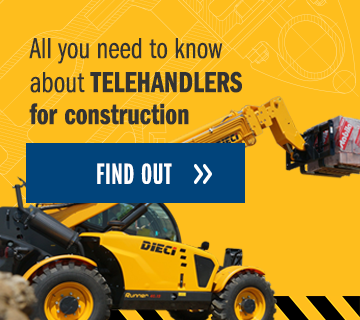 View the video to find out how to familiarise yourself with the safety systems and operation of the Dieci Construction Telehandlers. Webbline offers a range of equipment that has been designed and built to offer the greatest protection for all users. Telehandlers are the perfect example of machinery that can improve health and safety risk of your construction projects, as they can be fitted with attachments specifically designed for the job you need them to do, rather than 'making do' with machinery that's not fit-for-purpose. The extremely versatile telehandler is a construction project’s best mate. Whether you’re needing to pick up and place objects around the site, or you need to use it as an access platform or a crane, a telehandler can do it all depending on which attachment is being used. Most manufacturers would agree that a telehandler's versatility is the main and large advantage that it has over a small crane. Whether the machine is compact, for use in city construction sites, or bigger, for jobs that need higher lift heights, a telehandler with its many attachments, is a highly flexible tool. Take a look at putting up scaffolding for example – usually a pretty labour intensive and dangerous job that can be made a lot safer and easier with the help of the right access equipment, such as a telehandler. Telehandlers are also the ideal tool for lifting on a construction site, with the later models (such as the Dieci Hercules Telehandler) having a lifting capacity of 21 tonnes and reaching a height of 10m. The Hercules telehandler ticks all the health and safety boxes. Its highly advanced hydraulic solutions make it suitable for every site from construction and mining, through to harbours and shipbuilding yards. The Dieci Hercules Telehandler might be the perfect piece of machinery on your next high-rise construction job. The best telehandler for a particular construction business will depend on your construction project and among other things, the required maximum reach and lift capacity. This selector tool will help you decide which telehandler best suits you. This part is crucial. You need to know you’re working with a supplier you can rely on. Whether it is increasing your site efficiency, resolving current machinery issues or looking for ways to optimise your enterprise, you need to work with a supplier like us who can provide the solution to your requirements. And when it comes to construction machinery, Webbline stands above the rest. Offering the right product at the right time is our philosophy at Webbline and our team understands the rewarding yet often unpredictable business of construction. We know first-hand that 'one gumboot does not fit all' when it comes to construction requirements. So, to ensure each of our construction clients run the best machine for their individual operation, our focus is simple. We use our extensive expertise to provide individually tailored, top quality, advice and machines. We then partner with you throughout the entire hard-working life of your machinery to help you to get the results your business demands. A key way that we do this is through our unrivalled after-sales support service which includes a 24-hour, technical phone helpline to support your queries, day or night. We also understand that in your business, time is money, so we have a nationwide network of trained service personnel ready to keep your machine running at maximum efficiency, year after year. We hope this has given you a taste of how Webbline can help you in your future construction projects. We look forward to helping you achieve your construction business goals through the use of top-quality construction machinery.